The Mubarak Pumping Station is the centrepiece of the Toshka Project. 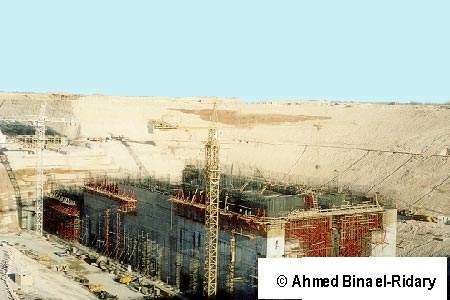 One of the largest of its kind in the world, it has a discharge capacity of 1.2 million m&#179;/hr, drawing water from the adjacent Lake Nasser. 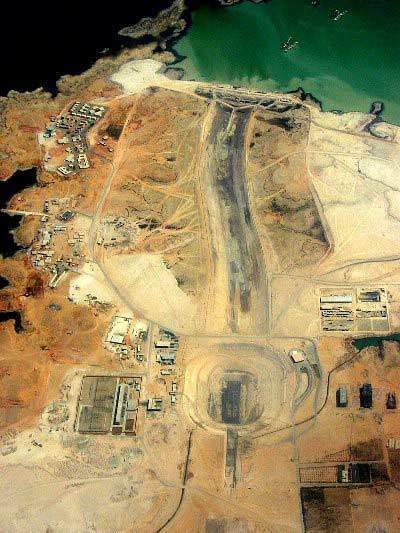 Aerial view of the construction area with the pumping station and the 4km inlet canal connecting it to the artificial Lake Nasser. The Mubarak Pumping Station pump-house sits like an island in a lake, completely surrounded by water. The pump house has 24 load-controlled, adjustable speed, vertical pumps arranged in two parallel lines. 18 of these run continuously with three offline at any one time for rolling maintenance and a further three held in reserve. The Sheikh Zayed Canal forms the second key element of the project. Its tapered sides have been lined with polymer sheeting over layers of cement, sand and concrete to minimise seepage. Egypt forms part of the world's most water-scarce region; more than 95% of the country is desert. 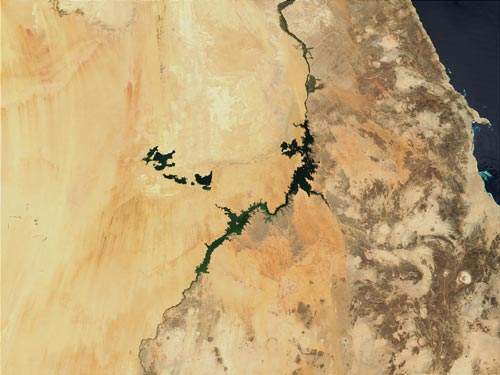 This satellite photograph shows Lake Nasser (centre) and the Toshka Lakes (centre left). A system of steel mini-piles installed around the base of the Mubarak Pumping Station, connected to a foundation raft, protect the structure from earthquakes. The station design contained a number of innovative and unusual features. In March 2005, the Mubarak Pumping Station – centrepiece of Egypt’s ambitious Toshka Project to reclaim half-a-million acres of desert – was named one of the five most outstanding civil engineering achievements of the year by the American Society of Civil Engineers (ASCE). Five years and some $436 million in the building, almost every aspect of the plant, one of the largest of its kind in the world, posed significant challenges which ranged from coping with the extreme temperatures of the region to incorporating cost-effective earthquake protection. In addition to the pumping station itself, the Toshka Project also involves the construction of 50km of main transfer canal, four additional 22km side branches and 800m of feeder pipeline. The complete development project – originally scheduled for final completion in 2017 – has a final anticipated cost of around $70 billion and is intended to double the region’s arable land, create 2.8 million new jobs and attract over 16 million people to the new towns planned. Over the past 20 years, the population of Egypt has risen from 20 to nearly 70 million and it has been predicted that this trend will continue, reaching an anticipated 120 million in the next 20. The distribution of this population within Egypt is fairly typical of much the rest of the Middle East region. An estimated 60% live in urban areas – in cities which are growing faster than infrastructure to support them – while the mounting numbers in rural areas provide a ready supply of new migrants to the towns. This increasing urbanisation of the population places increased demands on the water supply, further exacerbating the problem for a country which is 95% desert. 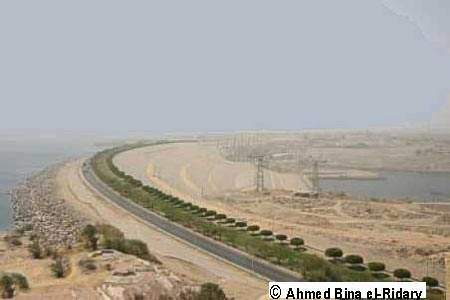 The Toshka project – an ambitious project to create a second Nile Valley, redirecting 10% of the country’s allotment of water from the Nile via a massive irrigation scheme – arose as part of a plan to increase the inhabitable land from 5% to 25%. One of the Egyptian Government’s mega-projects, Toshka and the Southern Egypt Development Project aims to develop and extend agricultural production and create new jobs and population centres away from the narrow confines of the Nile Valley. It has been called “Egypt’s hope for the 21st century” but installing modern irrigation systems on such a scale is costly and takes time. Inevitably, funding constraints have had an effect over the years, though at the end of June 2005, 90% of the project infrastructure was described as completed, with the remaining work progressing on schedule. As might be expected with any undertaking of such magnitude, the project has provoked its share of controversy, both domestically and internationally. Scepticism has been expressed over the wisdom of developing water-hungry agricultural production, reclaiming land in the hottest part of the country and the likely long-term economic benefit which will result to Egypt herself, rather than to foreign investors. The strategic and social goals have also come in for criticism in some quarters. In addition, the ten countries which share the Nile basin have been involved in a variety of on-going disputes over the water resources for many years – scarcely surprising in the world’s most water-scarce region. North Africa and the Middle East is home to more than 6% of the globe’s population, yet holds less than 2% of the planet’s renewable fresh water, so many of Egypt’s neighbours view the project with understandable concern. However, with an annual 1 billion m³ of rainfall, 7.5 billion m³ of ground water and 5 billion m³ of recycled agricultural drainage water, Egypt argues that the scheme can be achieved without increasing the country’s 55 billion m³ quota awarded by the 1959 Nile Treaty. 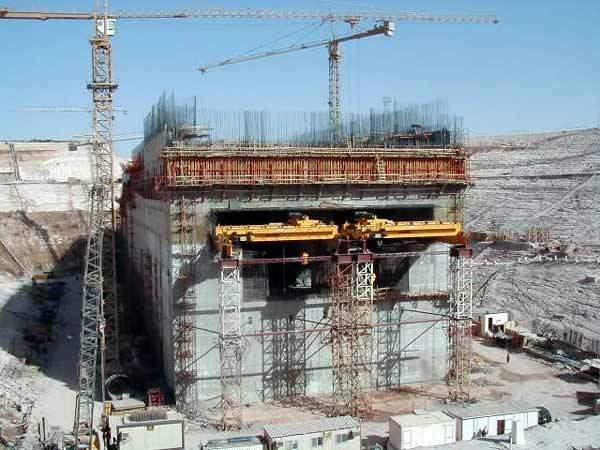 Described as a venture which “has expanded the boundaries of civil engineering,” the Mubarak Pumping Station is situated adjacent to Lake Nasser and has a discharge capacity of 1.2 million m³/hr. Its innovative design places the pump-house like an island in a lake – completely surrounded by water with 24 vertical pumps arranged in two parallel lines along both sides. 18 of these load-controlled adjustable speed units run continuously with three offline at any one time for rolling maintenance and a further three held in reserve. This arrangement, together with the use of an open 50m-deep intake channel – the deepest inland channel ever constructed – rather than a feeder canal, allowed the pump-house itself to be smaller, yielding reduced capital and run-on costs. The geographical location of the site also necessitated some innovative thinking. Using traditional concrete piles to support the structure in the event of an earthquake would have been very costly, so a system of steel mini-piles were installed around the base of the pumping station, connected to a foundation raft. This set up allows the piles to avoid compression loading, but leaves them free to tense against any seismic movement as well as offering a degree of resistance to shearing or overturning forces. Temperatures ranging from 0°C to 50°C are routinely experienced in the area, which meant that using normal expansion and contraction joints to make the structure watertight would have presented some problems. To avoid the need for a complex analysis of the potential thermal effects on the water-stops within the overall construction, the design only has joints above the normal high water lake level. Since coming into service, the station has pumped over 14 million m³/d of water out of Lake Nasser, enabling over 500,000 acres of land to be irrigated. Forming the second key element of the project, the canal was named in recognition of the $100 million donation to the project, made through the Abu Dhabi development fund, by Sheikh Zayed Bin Sultan El Nahayan, president of the United Arab Emirates. The decision to use a canal rather than a pipeline appears to have been driven by the volume of water involved, though obviously this has ramifications regarding loss by evaporation, particularly in the region’s hot summer. 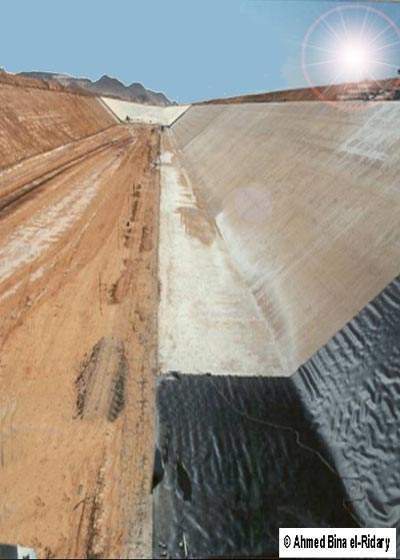 Seepage loss has been addressed by lining the canal with layers of cement and sand, concrete and polymer sheeting with a final coat of protective paint. 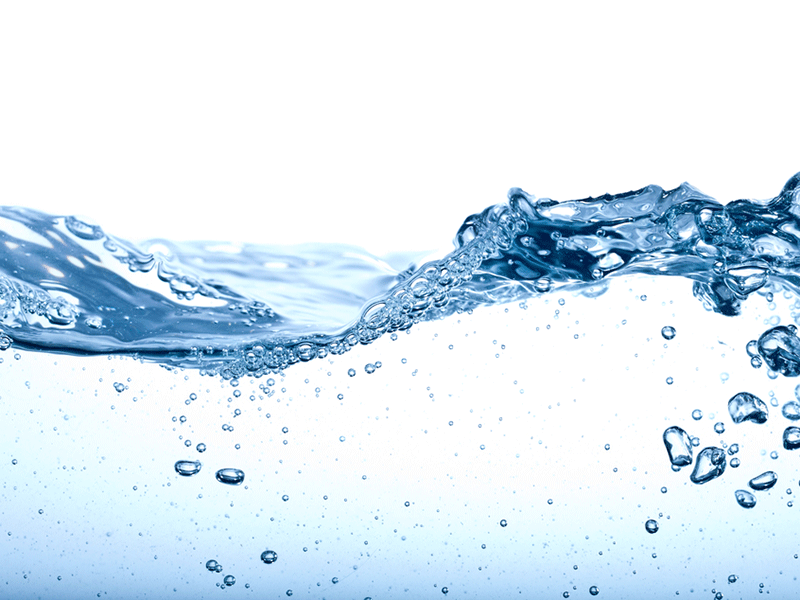 The project sponsor is the Government of Egypt’s Ministry of Water Resources and Irrigation. 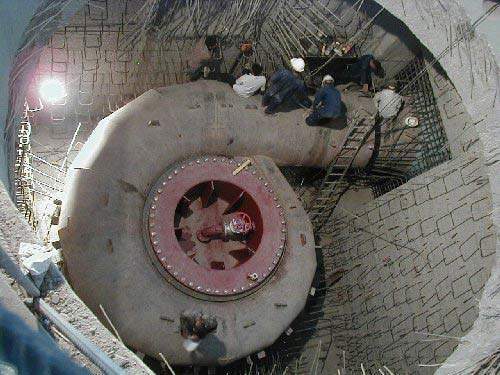 A joint venture between Hamza Associates and Lahmeyer produced the design of the Mubarak Pumping Station and the construction consortium partners were Arabian International, Skanska and Hitachi. The electrical engineering was done by ABB. Morris Material Handling provided cranes and Quantum Hydrometrie installed the ultrasonic discharge measurement systems. The project development and management team comprises a strategic partnership of KADCO and Sun World.